This month we are not focusing on a single plant but two groups- succulents and grasses. A lot of grasses don’t flower till fall so this is a good time to feature them. Although there are a lot of ‘evergreen’ grasses to choose from, a lot of them go dormant for winter and need to be cut back. Most prefer sun but there are some that prefer a shady area. 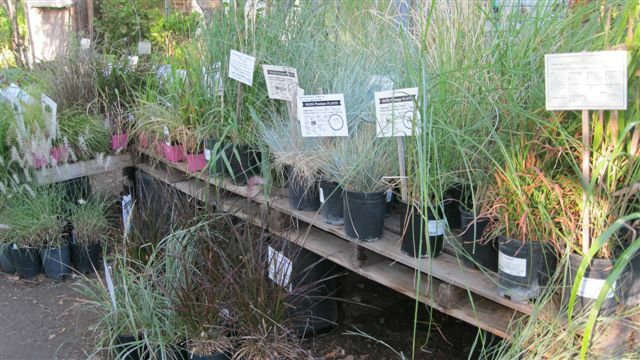 Grasses come in all sizes from 6 inches tall to 6 ft. tall. Some prefer moderate to regular water but there are Ca. Native grasses that thrive on very little. Ornamental grasses are deer resistant and there are a few that are gopher resistant as well. They can be planted in mass as a lawn substitute, mixed with other shrubs and perennials or used as a bank cover for erosion control. This means there is probably a grass out there to fill any requirement. I drool over those pics in Sunset Magazine of those So. California to San Francisco gardens filled with cold sensitive succulents like aloes and echeverias and soft agaves. However that being said there are a lot of cold hardy ones out there to chose from. We have stocked up on both kinds for September. We try to mark the ones that are only hardy to 25 degrees so you know what you are getting. 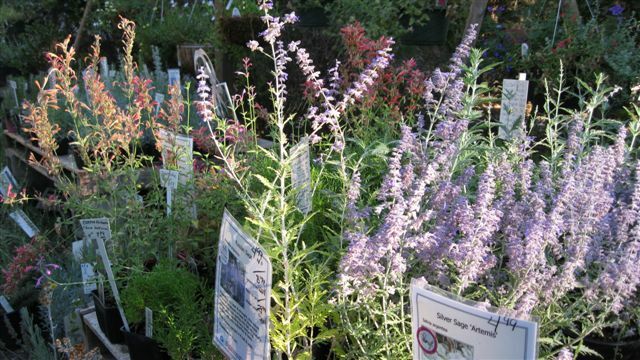 Some of our light frost areas might not have to protect these at all but the rest of us will have to grow them in containers and bring under cover or even indoors for winter. 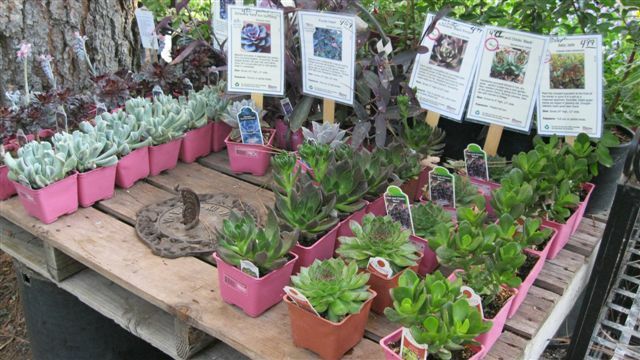 Succulents are very waterwise and most can be grown in a light shade or sun. Check out some of our cold hardy agaves, sedums and sempervivens, along with cool aloes, echeverias and more. Labor Day weekend is here, the unofficial last days of summer. It has us preparing for fall at the nursery. I am hoping for a busier than usual fall. Although people are talking a possible El Nino year we can not count on it. That means with the water restrictions in place that this is the prime season to plant more than ever. I can not stress to you enough how much more established your hardy trees, shrubs, and perennials will be come next summer if you get them planted at the end of this month and the first of October. Do it before the November chill hits and the soil begins to cool, inhibiting root growth. So even though the above ground growth is minimal this time of year the plants will be growing below ground. It’s time to take out some of those heavier water users in your landscape and replace with water wise, climate appropriate plants. We have plenty of great stuff to plant. This is the best time to plant Natives and we still have Matilija Poppies for fall planting. 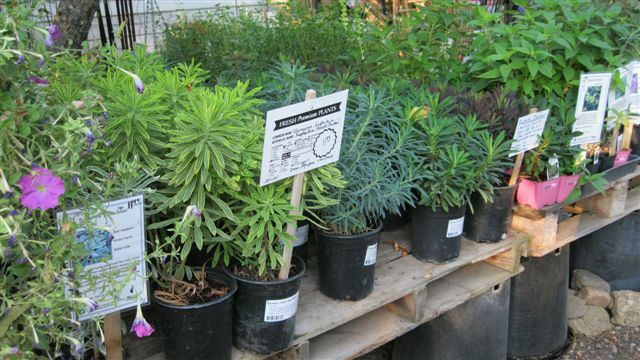 Our Euphorbia selection is the best it has been in a long time. We have some of the last to bloom perennials like Mums, Bluebeard and Golden Fleece along with those great long blooming into fall perennials like coreopsis, rudbeckias and echinaceas. We are starting to stock up on the cool season edible garden as well as pansies and ornamental kale/cabbage. 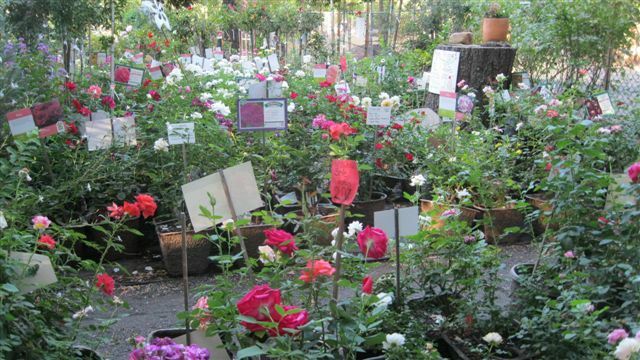 Our roses were in fantastic bloom all August as well as a nice selection of Crape Myrtles and Rose of Sharons. We have restocked the sweetpea and Ca. Poppy seeds along with your cool seson vegetable seeds. Organically grown onion sets and some potatoes are due to arrive the end of the month. The first of the fall bulbs is here, the bearded iris. They come first as they really should get in the ground before Oct. 1st. The rest of the fall bulbs for spring bloom (think daffodils and tulips) will come the 2nd week of Sept or so. Spring blooming bulbs are very water wise since they are dormant in summer and require no water at that time. Even if you do not plan to grow many winter vegetables you might consider planting your beds with a nitogen fixing cover crop that you can then till under for green manure. Thanks to Renee’s seeds we have Kodiak Mustard in jumbo packs, along with canisters of covercrop and of course fava beans. Keep in mind that the more fertile and rich your soil is the less you will have to water next year. We just stocked up on terracotta pots for fall as we were starting to get low on inventory. We are expecting a metal order this week so keep an eye out for a fresh supply of cool critters and big sunflowers. Now is a good time to feed everything again and fall is the time to apply 0-10-10 Bloom Food to your spring blooming shrubs like lilacs and quince and to your fruit trees. Start backing off on water on your fruit and shade trees at the end of this month so they can start the dormancy process. Hope to see all of you at the nursery soon for prime planting time.